is a research fellow at the Institute for Social Anthropology of the Austrian Academy of Sciences. (died 2015) was professor and director of the Institute for Religious Research at the Tibetan Academy of Social Sciences, Lhasa. 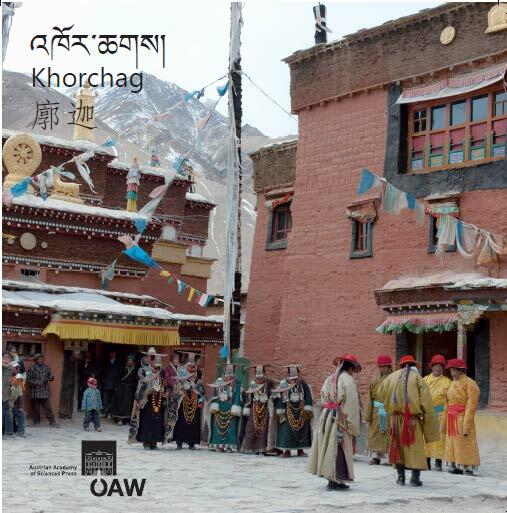 Das Kloster Khortschag (Tibetisch 'Khor chags, Chinesisch Kuojia) in Purang, Westtibet (Präfektur Ngari, Autonome Region, VR China), gegründet zu Ende des 10. Jahrhunderts unserer Zeitrechnung, ist eines der drei ältesten buddhistischen Klöster des historischen Westtibet. In der Nähe des heiligen Berges Kailas gelegen, ist das Kloster bis heute in ganz Tibet wegen seines Erbes alter sakraler Kunst berühmt. Die visuelle Dokumentation seiner Architektur und der in Khortschag erhaltenen Wandmalereien, Skulpturen und Ritualgegenstände sowie der religiösen und festlichen Traditionen, die in diesem Band mit großteils neuen Informationen zum ersten Mal vorgestellt und erläutert werden, bietet reichhaltiges Studienmaterial für alle, die diesen historisch bedeutenden Ort besuchen oder studieren. Mit mündlichen und schriftlichen Berichten zu den Verhältnissen in vormodernen Zeiten sowie Angaben zur Erhaltung und Wiederherstellung der spezifischen religiösen und kulturellen Traditionen vermittelt dieser Band einen Überblick über die Geschichte, sozio-ökonomische Organisation, Baukultur, Kunstgeschichte und religiösen Traditionen dieses Klosters und gibt Einblick in die kulturellen Traditionen der Dorfbevölkerung, wie zum Beispiel Lied- und Tanztraditionen und die Aufführung religiöser Stücke. Founded in the late 10th century CE, Khorchag monastery in Purang, Western Tibet (Ngari Prefecture, Tibet Autonomous Region, PR China), is one of the three earliest Buddhist monasteries of historical Western Tibet and, due to its ancient sacred artistic heritage, renowned all over Tibet. The detailed visual documentation of the architecture, wall-paintings, sculptures and ritual paraphernalia extant in Khorchag, as well as the intimate visual documentation of ritual and festival traditions, provides rich and to a large degree new information and substantial study material for visitors and students of this important place. Most of this material is recorded, presented and discussed in this volume for the first time. Including oral and written accounts of relationships in pre-modern periods as well as reports on recent achievements in preserving and restoring specific religious and cultural traditions, this volume gives an overview of the history, socio-economic organisation, building structure, art history and religious traditions of this monastery. It also provides insight into the cultural heritage of the village population, such as local song and dance traditions and performances of religious plays.